The Philips MG100/16 Series 1000 Precision Beard Styler is one of the best models available in the market if you want to cut/trim/style your beard to precision and to the length that you want, thanks to the settings and attachments that it comes with. If you have been struggling hard to get the perfect sideburns and well-styled edges all along in your life, you must try this facial hair trimmer to know what wonders you can work on your skin. Read our beard trimmer review for the features, pros, and cons of this trimmer. Three precision combs of 1mm, 3mm, and 5mm so that you can choose any length in your goatee, stubble, moustache, etc. Worldwide voltage compatibility and never needs to be oiled. Use the Philips MG100 16 Series 1000 Precision Beard Styler for correcting your sideburns and necklines. However, if you want to make intricate styles on your beards and get the perfect trim on them, you must be prepared to spend a lot of time. 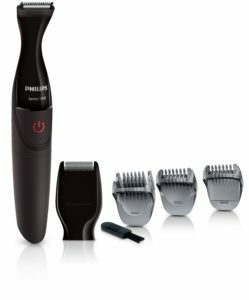 If you are those “quick-shave” types, you will not find much help with this trimmer and would be better off with a higher-level trimmer like the Philips BT7202/13 Series 7000 Beard and Stubble Trimmer with Integrated Vacuum System Review .The Philips MG100/16 beard styler currently has 4.1 out of 5 stars with 79% four stars or higher, and only 2% with 1 star. This trimmer will get the basic job of a beard or stubble trim done for you.